Amazon Web Services (AWS), Amazon.com’s cloud computing division, has signed a first-of-its-kind agreement with its retail electric utility, Dominion Virginia Power (DVP). Recently, RMI met with members of AWS to better understand how they are working together with Dominion Virginia Power (DVP) to help meet their renewable energy goals in Virginia. To understand how unique and game changing this agreement is, one must understand how utility services traditionally work. DVP controls the entire flow of electricity, from generation to meter, for its retail customers like AWS. DVP is a fully integrated utility, that either self generates and/or purchases electricity from others, and distributes it to its customers at a retail price approved by the Virginia State Corporation Commission (SCC). This includes selling the electricity to AWS for its data centers in northern Virginia. AWS has signed power purchase agreements (PPAs) that enable four utility-scale renewable energy projects to be built in the Eastern U.S. In the past, the electricity generated through these renewable projects was fed into the regional grid and earned the PJM wholesale market price. Meanwhile, AWS data centers in Virginia consumed energy from another part of the same grid paying retail rate of electricity based on DVP’s power mix. DVP’s power mix today includes generation from both renewable and fossil fuel sources, but the ratio does not enable AWS to meet its ambitious renewable energy goals. 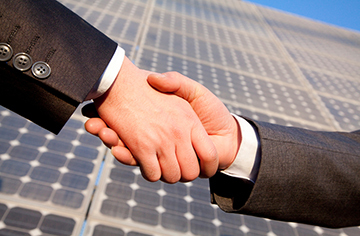 According to AWS, through this new agreement with DVP, which was approved by the SCC, AWS may contract for and DVP may perform specified energy management services to administer the scheduling and settlement activity related to AWS’s wholesale market participation of AWS’s investments in its wind and solar projects, including any future Amazon contracts for renewable energy projects. Under a separate agreement, approved by the SCC, AWS will also now pay a market-based retail rate that closely matches the wholesale market rates its renewable energy projects earn. DVP wants to work with Amazon to provide more choices and accommodate its renewable energy goals and requirements. This arrangement provides AWS with a “one stop shop” to complement AWS’s traditional electricity management with wholesale and renewable energy purchases. This unique arrangement is another successful innovation on green tariffs that have started to emerge around the country. 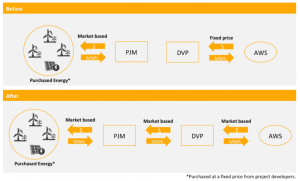 Utilities like DVP traditionally offer similarly situated customers the same electricity for the same price, and traditionally this has been through fixed, low variable retail rates. AWS has a long-term commitment to power its global infrastructure with 100 percent renewable energy. The four renewable energy projects built through AWS’s PPAs—the Amazon Solar Farm U.S. East in Virginia, the Amazon Wind Farm Fowler Ridge and Amazon Wind Farm U.S. East both in Indiana, and the Amazon Wind Farm U.S. Central in Ohio—will generate more than 1.6 million MWh of power every year, equivalent to the electricity used by more than 150,000 U.S. homes, according to the company’s website. Amazon’s wind and solar PPAs are exactly the type of large-scale renewables transactions the BRC helps major corporations execute. Though AWS becomes the first DVP customer to pioneer this special arrangement, a related,similar proposal to offer market-based rates currently under review at the SCC would allow other qualifying DVP customers with ambitious renewable energy goals to follow suit. This could dramatically change the way that corporations enable large-scale renewable energy projects in Virginia, allowing them to work with their utilities to tailor solutions to the companies’ unique energy needs on the regional grid. The BRC and the leading corporations like Amazon that make up its membership—not to mention the Renewable Energy Buyers Alliance (REBA) partners working in regulated markets with utilities—are driving the corporate renewables market. In an unfolding era of the customer-centric electricity grid—one in which non-utility buyers last year accounted for the majority of new wind capacity in the U.S.—this new deal between Amazon and Dominion is another proof point of changing times and the growing momentum behind corporate renewables. Copyright 2016, Rocky Mountain Institute. This content first appeared on RMI Outlet and is published here with permission. Today’s Corporate Renewable Landscape—Where Do We Stand?